How is it October already? I honestly feel like we were just celebrating Christmas the other day and now it’s only two months away. Insane!!! October is one of my favorite months because there are pumpkins everywhere, halloween and everything Fall!! I just really hope that this weather here get’s the message that it’s Fall. We are still experiencing weather in the high 80’s to 90’s. I’m over it y’all!! Bring on the cold weather!! Enough of my random ramblings…let’s get to business. 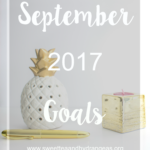 Today I’m going to be recapping my September goals and share what I want to accomplish this month. -Work out 2 x’s a week (at least)// Yes!!! I am determined to look hot as ever in my wedding dress next year. Gotta get it all toned up! -Finish reading The Perfect Stranger// I did not even open this book. I did no reading at all in September. -Start using products that I receive in my Ipsy/Play! by Sephora boxes// Yes!!! Slowly but surely I am using a lot of the products I have received in those boxes. I plan on continuing to do this. -Continue saving money for my wedding// We have saved up more money and will keep on saving. -Write two beauty posts// I finally accomplished this!!! I wrote this post and this one. 3/4 I am so proud of myself for accomplishing almost all my goals last month. -Set a date for my engagement photos// I know that we need to take them in mid February to late February in order to get the Save The Dates out in time. -Start finalizing the rough draft of our wedding guest list// At this time we have 200 people that we can invite to our wedding. Our wedding list is around 220 right now. I was told that it’s better to over invite by some because not everyone will be able to make it potentially. We shall see what happens! -Start looking into hotels to block off for the wedding night// Seeing that our wedding is during a huge music festival getting those rooms booked ASAP is a must very soon. 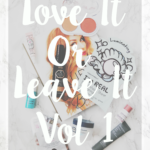 -Write five beauty posts// Seeing that I was able to write the two I set out to last month, I know I got this for this month! -Write five blog posts ahead of time// I was doing really well with writing posts ahead of time a few months back but have slacked on this. It’s so much less stressful when I have my posts done ahead of time. -Continue working with brands// Over the last month or so I have been able to work with some awesome brands. Some of these brands I knew and some I was not familiar with. I love being able to try out new products and working with brands. -Start saving money for Christmas presents// Christmas will be here before we know it. I want to be prepared as early as possible, so I am not rushing last minute. I have set a lot of goals for this month. If I accomplish all of them I will be excited but I’d be happy just getting all my wedding one’s accomplished to be honest. Fingers crossed I do well! 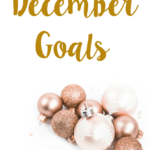 What are you goals for this month? What did you accomplish last month? It is such an awesome feeling to check off your goals! Can’t wait to see some of your new posts. I like that you write out your goals! I need to start doing this! I tell my clients to and I need to take my own advice! Thank You Megan! I try to write them out every month, so I hold myself accountable with getting things done. Writing them down definitely helps for sure!!! I was doing so well with planning my posts but now I have like nothing ready! I agree it is so much easier when you plan ahead! Good luck with all of your goals!! I was too but then wedding planning came into play,etc….so I am not going to lie but other things have been put first before blogging recently. Hopefully we can both get back into the swing of writing ahead of time! these are great goals misty! I def need to save $ for xmas gifts too! Thank You Cait!! Saving for Christmas is so important with it coming up very soon! I also can’t believe it’s already October! I’m already seeing Xmas memes on Facebook… crazy! Looks like you have lots of wedding planning things in the works – good luck with all of that! And I too need to seriously start saving up for Christmas shopping… feels like I just figured out what to get everyone in my family last year for gifts. Time to do it all over again I guess! Shannon I know!! It’s just crazy to think that Christmas is right around the corner. I do have a lot of wedding items to check off my list, I am hoping I can get them done ASAP. I have already been asking my family members what they want for Christmas, so I can get a head start on my shopping. Wauw that’s a busy list! I hope you complete all your goals!! Thank You!!! I am hoping that I am able to accomplish all of my goals this month. Fingers crossed! You’re a busy lady! With all you have to do, you even remember Christmas! hahaha You go, girl. Wish you the best! Mikki I am very busy especially with wedding planning currently. I try to plan way ahead of time when it comes to things. So if I can get Christmas done as early as possible, I am one happy girl. Thanks for this post. 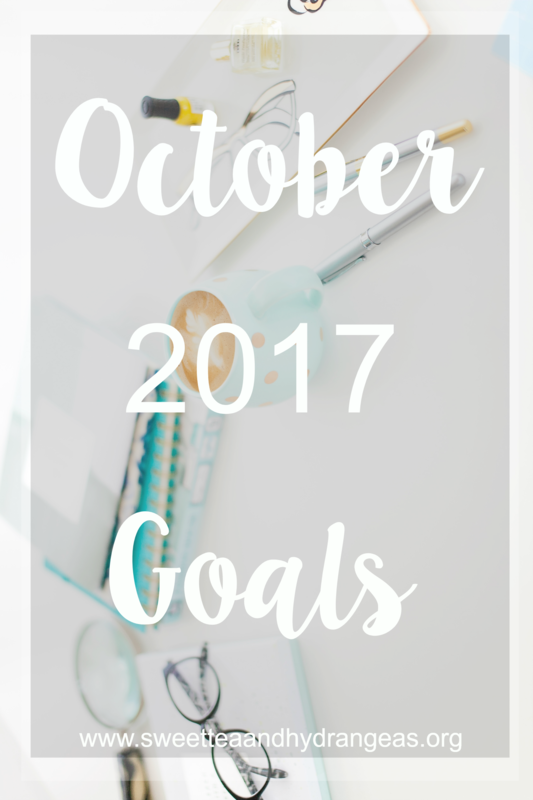 I going right away to set my personal goals and blogging goals for october. You’re welcome Eki. Good luck with setting your goals for this month. You did awesome with September! Nice job! I really can’t believe it’s already October. When I saw the Christmas decorations out the other day, I just wanted to cry. Slow down time! So exciting to be doing all the wedding stuff. Can’t wait to follow your journey to the big day! Thank You Shann! !I am happy that I accomplished almost all my goals last month. This year certainly has flown by for sure! I saw some Christmas stuff out already as well. Just crazy to think how time has flown by. Girl, you were a rockstar with your goals last month. 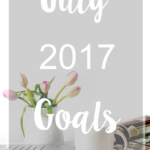 I have no doubt that you’ll totally knock this month’s goals out of the park, too! I’m excited for you that you get to plan your engagement photos!!!! Finalizing the guest list is stressful but it’s true that some people won’t be able to make it so try not to stress over that too much. I can’t wait to see what other beauty posts you do this month! Cheers to an amazing October! Good luck with the guest list! And I’d like to try writing posts ahead of time as well. Never worked for me, but I do love when a post is done, ha! Thank You Lorna! The guest list is slowly but surely coming together (and getting longer). I would love to get posts written out ahead of time as much as possible. Some time that happens and other times it does not. Great job with last month’s goals! I barely read myself last month. I am always so tired by the time I get into bed and can only read a couple of pages and then I find myself asleep with the book on my face. Haha! I really want to finish painting my bathroom and bedroom this month. Hopefully, I can get those done. Good luck! Thank You Elizabeth!! I would love to read more but honestly life is so busy that I never have time to just sit back and relax. Hopefully you will be able to finishing painting those rooms girl!!! Good luck with your goals this month. I love how you write out your goals for each month! I totally need to start doing this. Great job on hitting most of your goals for September! Wedding planning is so fun but it can be so stressful! Good luck with everything 🙂 I’m happy to share any tips if you have questions. I had a big wedding two years ago and I learned a lot in the planning process. Thank You Hailee!! I enjoy writing out my goals to ensure that I accomplish what I set out to get done. It holds me accountable. I have enjoyed wedding planning for the most part. Trying to get as much done as early as possible. If I have any questions, I will make sure to ask you! Way to go on September goals! It is hard to find a little time to read when you have a lot of other things happening. 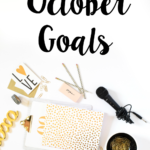 Your goals for October sound totally doable, good luck! Thank You Leslie! Yeah I would love to read more but life is busy. Hopefully soon I can curl up and read again. I’m hoping I can rock my goals out for this month. I love that you gave yourself credit for rocking the goals you accomplished in September, but did not get down on yourself for not meeting every single one. Sometimes, it is too easy to focus on what you did not do instead of all of the amazing things you did! 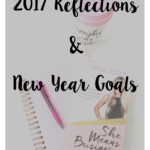 I love that you have a timeline for your goals that go well into the next few months and even next year! I bet that makes planning for your wedding much less stressful. And congratulations!!! Thank You Brittany! Sometimes accomplishing every single goal doesn’t happen and I’m okay with that. Being able to accomplish anything I set out to do is enough for me to be happy. Hoping that I am able to rock this months goals as well! I want to be as organized as ever when it comes to wedding planning. The more I get done ahead of time, the better. These are great goals for the month! I also need to get back to writing more blog posts ahead of time, lately I haven’t been able to write a bunch ahead of time and it’s not helping my productivity! Thank You Kristin! Writing blog posts ahead of time is such a huge help for me with my crazy schedule. I wish I had more time to write the posts ahead of time as well. I always love reading your beauty posts – some of my favorites! Look forward to them! We have quite a few of the same goals for October! I’m working on planning our engagement session too, and saving as always for the wedding. And making it to the gym more – glad we both managed to do it in Sept – hopefully we’ll keep it up! That’s awesome that we have similar goals Cameron! I also see that your from Louisiana which is where I am from as well! I’m hoping to have our engagement session done in February to get our Save The Dates out early March. So exciting for us both!! I hope to keep up the gym sessions this month as well. Good luck with your wedding planning! I need to start saving for Christmas too. It’ll be here before we know it and I’m not prepared right now. Good luck with your goals this month. Jenny I literally can not believe that Christmas will be here soon! I want to be as prepared as possible this year with us planning a wedding. Yay! I love October! So inspiring 🙂 Cant wait to check out all of your beauty posts coming up and good luck with all the wedding business! Stephanie I love October as well! I will be having a beauty post up tomorrow and more coming soon. 🙂 Wedding planning is slowly underway. I’m trying to work out 3x a week!! GOOD LUCK! Love your goals! You got this girl–and I love how you’re breaking all of your wedding tasks up–it’s way more manageable that way! Thank You Allison!! I am trying my hardest to be as organized as possible with all my wedding tasks. I do not want to be crazy stressed while planning the wedding. If you have any tips let me know!! These are some great goals! Working out can be hard, but it’s so worth it. I love the idea of saving ahead for Christmas!! EEEE! I can’t believe you are at this stage of your wedding planning! It’s going to be here before you know it! Chelsie I can’t believe it either! It felt just like we got engaged in May. Time is flying by!! I am in get stuff done mode! I got married and moved this summer and I wrote blog posts way ahead of time for that time. I’m glad you are planning to get ahead. It’s great to be able to step away from the blog and just enjoy! Congrats on your marriage Kari! I am trying to write as many blog posts as I can ahead of time. It makes blogging life so much easier when they are planned out ahead of time.